You can add multiple tasks in 5pm using the “+” button on the top of the left panel. 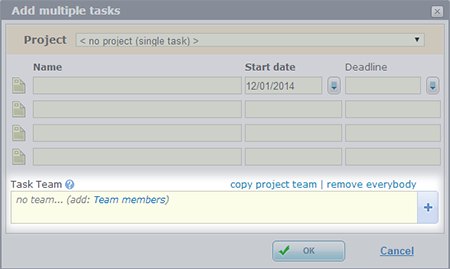 Now we extended this feature to allow you to also select the task team when doing it. Please note that if you have the flag turned on to automatically self-assign created tasks to yourself (via “settings”) – you will be automatically added to the team here as well.